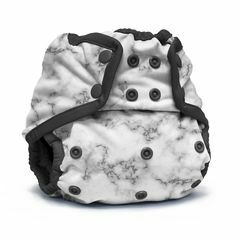 The Rumparooz onesize nappy wraps are designed to grow with your baby. They are generously sized and designed to fit over any fitted or prefold nappy. They can also be used with bio-liners or a hemp or bamboo insert/6r soaker can be placed directly in the wrap. Available at Kingdom of Fluff in snap or aplix fastening and a variety of cute prints.